Stack Overflow, due to its size, has some unique problems. One of those is flags. For example, in the last 30 days as of the time I am writing this, there have been 26,710 flags. That is 890 flags per day on average. Even with active community self-regulation, moderators occasionally need to intervene. Moderators are human exception handlers, there to deal with those (hopefully rare) exceptional conditions that should not normally happen, but when they do, they can bring your entire community to a screaming halt — if you don’t have human exception handling in place. The most common moderator task is to follow up on flagged posts. Every post contains a small flag link, which anyone with 15 reputation can use. Flags are good. Flags help us maintain Stack Overflow and improve it. But there are so many of them. If you do the math, and assume each flag takes about one minute to look at, load the page, and decide (probably an optimistic number), that is 890 minutes of work per day -- almost fifteen hours in total. As of now we have sixteen community moderators, visible on the /users page of Stack Overflow. Of course, serving as an elected community moderator is, and always will be, a completely voluntary at-will activity. But I believe the sheer scale of Stack Overflow now demands some additional policies specific to Stack Overflow community moderators. We are not asking anyone to make special accommodations, but it is increasingly untenable for us to have elected moderators who spend substantial amounts of time on Stack Overflow, but do not participate in the primary duty of a moderator -- that is, helping us follow up on and resolve flags from Stack Overflow users. It's unfair to the other elected moderators, and it is unfair to the community. Just as in open source, "many hands make light work", but this requires each of the moderators to be truly pitching in and contributing by resolving flags by clicking that bright orange number periodically throughout the day. We are of course open to adding more community moderators. But that is avoiding the issue. I believe we regrettably must have a new, specific policy for community moderators on Stack Overflow, due to its size and scale: I propose that on Stack Overflow, all elected community moderators must close a 'reasonable' number of flags while they are on the site. If they do not, they cannot continue to hold the position of Stack Overflow community moderator. "Reasonable" is of course To Be Determined, and the point of this is not to demand specific numbers -- all we're looking for is a fair and equitable balance of flag handling among community moderators over a period of 2-3 months. Automate and offload to the community. High rep users can already vote to close, migrate or delete bad or off-topic questions. They can not do much for equally bad answers. Perhaps we could trust the system to delete answers identically flagged by a group of high rep and/or high flag weight users? the post just says "Thank you"
and leave the more difficult cases to the moderators. We can't simply keep adding moderators in order to compensate. This doesn't just side step the issue, it creates more work for the existing moderators as well. New moderators require training and help initially, which means more must be asked from the people who are willing to spend time focusing on moderating. I can't conceive of someone wanting the responsibility unless they visit and use the site on a regular basis with plans to continue doing so. Things do happen in our lives and I don't think anyone should feel bad about not being able to spend much time in their capacity as a moderator due to personal issues. Additionally, some days are simply more exhausting than others. I think we should set some expectations, as long as they remain 'on the average'. Services an average of 60 - 100 flags per week. Note that it's extremely common to clear ten flags within a minute, depending on the nature of the flag. As said above, of course there will be periods where a moderator simply can't give that much time, but on average I don't think it would be difficult. Participate here on meta. Answer a few questions each month asking for support, help the community manage the frequent duplicates, help with the (few) flags that we get here from time to time. Participate in chat on occasion. A lot of ideas regarding moderation are discussed in the moderator room, like "what the heck do we do with these old and famous questions that aren't on topic any longer?" I realize that some may view any help that someone can give as welcome, but I think that outlook sours when it becomes obvious that a slot that could otherwise be much more productive is being blocked. While moderating, we come in contact with everything that the community objects to, which is frequently very smelly stuff. It really is not fair for some to spend the bulk of their time earning esteem, reputation and badges while the rest of us labor in the proverbial salt mines that double as an adult day care center. It comes down to 'responsibility' in the term 'want the responsibility'. While it is a completely volunteer effort, I don't think it's unreasonable to imply a bit of obligation when mentioning the responsibility. In my opinion, I feel that moderators are doing a very good job. Moderators shouldn't be punished for a volunteer job that they do out of passion. Having said that, I would concentrate on ways to help them to do their job better. Classify the general users into four categories based on the criteria defined below. with less than 500 flag weight. and also have less than 60% of their flags being deemed valid. and also have a minimum of 60% of their flags being deemed valid. with flag weight between 500 and 700.
and also have a minimum of 80% of their flags being deemed valid. Anything less than 80%, they fall under Red bucket. with flag weight above 700.
and also have a minimum of 95% of their flags being deemed valid. Anything less than 95%, they fall under Yellow bucket. If someone belongs to Green bucket, we can make a reasonable assumption that the flags will be more likely legitimate and similarly the flags from users in Gray bucket would need more attention. So, the level of attention required on flags from Gray, Red, Yellow and Green bucket would very high, high, medium and low respectively. However, there could be some disambiguations that may arise when Green bucket users flag a post that might need moderator's intervention. I believe this is where Moderator's should spend their valuable time instead of concentrating on flags from Gray bucket users. Following point discusses how to handle that. Have a pool of volunteers from Green bucket for flag moderation. If someone has reached the Green bucket, I believe that they know what they are doing when they flag posts. These volunteers are not elected moderators but are very active members who are doing an excellent job in helping SO to maintain the quality of content. I call them Flag Validators. They can validate the flags from Gray bucket users, which I believe could form quite a percentage of 890 or so flags every day. Flag validators should be given tools to validate only flags from Gray bucket users. Their good work as flag Validators can be used as a criteria during future Moderators election. Diamond moderators can occasionally monitor how these Flag validators are doing their job and intervene if there are any serious disputes. 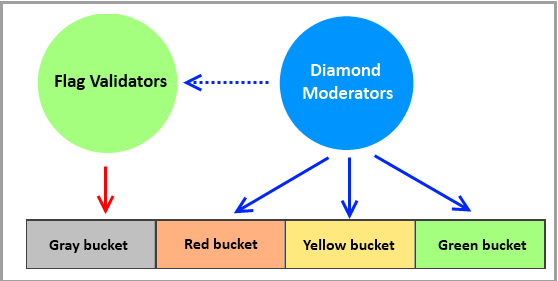 Diamond moderators can concentrate on flags from the top three buckets that need higher interpretation. This way they can better utilize their time avoiding flags from users who don't understand the concept of flagging. I hope that I am making some sense here. It's long bugged me that there is a double standard for moderator duty. On every Stack Exchange site except this one, the standard is doing moderator-type things once in a while. As long as an inactive moderator isn't destructive, the only reason we de-diamond is to avoid a minor security risk. It's not a huge deal to appoint or elect a more active moderator while retaining less active moderators. We can always create more diamonds, if needed. When I was a moderator on a tiny site, I really felt it was a luxury to have a less-active moderator waiting in the wings. It's handy to have someone in a respected position who hasn't handled many flags to step in when there's a conflict. When there are only a handful of flags pending at any one time, clearing flags is less important than being a mediator and leader in the community. But on Stack Overflow, the primary (and often only) responsibility of a moderator is clearing flags. Since there have been 2.8k flags so far today and since there are 18 moderators, we need them to average 150+ flags handled to stay above water. In practice, that means some moderators handle hundreds of flags a day while others clear far fewer. Moderators have access to a leaderboard that shows how everyone is performing, so the discrepancies are obvious. I've had the privilege of talking with several former Stack Overflow moderators (who happen to be co-workers) and heard firsthand the frustration with being unable to clear the flag queue. When there are thousands of unhandled flags aging away, the moderator leaderboard turns out to be discouraging. It's easy to blame the people at the bottom of the list for not pulling their weight. Having handled another type of support queue, I can certainly see how this is a problem. Unfortunately, a standard of duty tends to hurt us on #1 and not make any difference on #2. If anything, removing moderators for inactivity reduces the overall effectiveness of the team. I've done just enough flag clearing to know it's a skill that I haven't developed. Recently we've seen moderators who have handled 10s of thousands of flags removed from the role. That's a lot of experience to lose. Just as bad: it's not a great way to send off people who have done so much for this community. One solution might be to create an emeritus position we could offer to particularly deserving moderators upon their retirement. I envision moderators being eligible if they have cleared a large number (50k?) of flags. Functionally the main difference would be to move emeritus moderators to a new section of the moderator dashboard. (There's already a separate section for employee moderators.) They also would not be shown the flag indicator in the top bar. (They would still see flags in situ or by visiting the moderator dashboard.) Otherwise, they retain full access to the moderator tools and chat rooms. These moderators would not be asked to clear flags (though they certainly can). Rather, they continue serving the community as mediators, advisors and by guiding new moderators in their duties. The goal would be to continue applying a standard of duty for moderators on Stack Overflow, but not push out experienced moderators who have burned out. We can "free up a slot" for new blood without sacrificing the good will of long-serving volunteers. If they have run out of steam, maybe asking the question will make them realise that they don't really want to be a moderator anymore anyway. Give them an "I resign" button and the problem is solved. Can SE decide to 'fire' moderators, and on what basis? Yes, if 'due process' is respected (as outlined above), and on a 'reasonable' basis that can only be determined (in my opinion) by the moderators, in conjunction with SE. I think it's entirely reasonable to expect a minimum amount of flags processed on a weekly or monthly basis - I'm opposed to a daily expectation, as my own personal day-to-day can change drastically permitting time on SO one day, and none the next. One other improvement that could be explored is sorting flags not only by the the flag-author, but sorting them also depending on which moderator is reviewing them. For instance, I'm a PHP/CSS/jQuery guy, not a C#/Java/Python guy. If I see flags claiming some esoteric-sounding Java answer is 'Not an answer,' I'm really not in any position to evaluate that answer (in some cases the answer will be obvious, but not in all). Perhaps some type of shifting of content around for moderators can be done according to the tags or categories we're most active in. I may not have a solution, but I do see the problem (and see my part in the problem). Glad to see we can discuss this and work toward resolving the issue, and bettering the experience for others. I'm going to take this opportunity to suggest something I have been mulling over, but have yet to drop in a question. What about giving moderators some rep for clearing flags? Not a lot... Less than accepted edits for < 2000 rep users.... .1 per flag? The reason I suggest this is that we (should be) spending time clearing flags rather than answering questions, so we lose out on the rep we could be getting during the time we can allot to SO. There, I did it. Seems petty, but it might help motivate mods to clear out more flags. I don't know what a reasonable weekly (daily, monthly, etc.) workload is for a Stack Overflow moderator, but I don't think it's at all unreasonable to expect moderators to perform the duties they were chosen to perform. It's a volunteer position, sure, but I could go out and volunteer somewhere in my town and I can bet they'd politely tell me to not bother if I didn't actually do the work. There's no harm or shame in stepping down if one can't really fulfill the commitment anymore because their circumstances or interests changed. There is also potential for absentee moderators to miss important announcements or changes. So when they come back, they might act in ways that are no longer fitting in with the site. With that in mind, I think it's important to look at consistency of action instead of raw flag processing power. Someone who deals with 20 flags a week but is doing so consistently every week is a more active and involved moderator than someone who shows up every 3 months and blows through 240 flags in one go. I'm all for giving more guidance to moderators about what is expected of them: I think many people run for election on various platforms like "hands-off" or what-have-you and have no idea, if they become a moderator, the amount of work that's involved in being one. But reading your post and talking to waffles in chat, it sounds like replacing—instead of supplementing—moderators who are below-average in their activity is at least in part about making sure the moderators who are pulling their weight aren't demoralized or feel their moderatorship is cheapened because they have the same status. That it's cause for the hard working moderators to say, "hey, if Joe Smith isn't doing his fair share, why should I?" It's all a little too Ayn Rand for my taste. Who is John Galt? I can understand that it can be demoralizing to take care of a ton of flags, then check the moderator dashboard to see Joe Smith didn't handle very many at all this month but got 2,000 rep answering questions. But I think the suggested cause for the demoralization wrong: it's not because my diamond is cheapened because a "non-moderator" moderator also has one, it's because Joe Smith got something for his time on the site while all I got was another 100 flags. The incentive structure is messed up. One way to solve that is to increase the incentives for doing moderator activities: facetiously, it might be to give rep for handling a flag or something silly like that. But besides rewarding rep for an activity that doesn't promote the core function of the site (Q&A), it attracts the wrong kind of moderator. And it's really the other side to the same coin: whether you remove moderators who aren't as good as the diligent ones—thus rewarding the diligent ones with a "more meaningful" diamond next to their name—or you give rewards for doing moderator activities, you make moderating more about getting a carrot than about doing one's duty. That is, people volunteer to become a moderator because they love a particular site and they want to do their part to keep it running smoothly: they consider it to be their fulfillment of the social contract. You want people who are actively engaged in the main site, even when the flag list is overwhelming, because they are the type of people to take it seriously: they have skin in the game, and they want a better site because they use it themselves. The reward for them isn't a more meaningful diamond, it's a better site. At the same time, I do agree it is untenable to have an ever-growing list of moderators to supplement the changing interests of what are ultimately volunteers. But instead of making it about meeting a quota to ensure the diamond next to one's name is a substantial reward, make it a referendum. Every six months (or if you think it's necessary to evaluate every 2-3 months, do it every quarter), hold elections: if someone wants to keep being a moderator, they can run. If they can't be bothered, they can leave and no harm no foul. Make the moderator statistics on the dashboard visibile during the elections and let the community decide whether that person is pulling their weight. I'm not a mod, so I don't know the behind-the-scenes details, but it seems reasonable to quantify somehow the expected work of a moderator. There are two points that I think are important to make sure this stays reasonable, though, given the volunteer nature of the job. First, you're talking about moderators performing their duties, primarily the processing of flags, while on the site. Such duties should not interfere with the moderator's ability to be a "civilian", i.e., use SE for their own research. In other words, I don't think a mod should be expected to be processing flags any time the system has them logged in. Your proposed "standard of duty" will probably help with this, in fact. Given a standard, moderators can know when they have put in their time for the day and can feel free to use the site in a personal capacity. Second, I think throwing bodies at this problem is a good thing to try -- I don't think it's "avoiding the issue" at all -- and your proposal would also make this easier. Once you come up with a rough figure: "A mod should process N flags a day on average", you can do some simple division and figure out how many moderators a site should have in order to keep the per-moderator workload stable. I don't think that forcing a moderator to meet some standard is the the right approach. Some of us have more time than others, or just happen to be able to monitor the sites more frequently. At least on the SE 2.0 sites, if you only are on in the evenings, say, you might miss the only flag of the day because another mod was able to watch the site at work. (Obviously this doesn't apply to SO; my point is that there are higher traffic times that if a moderator doesn't catch, he won't appear to be doing as much.) There are some mods who seem superhuman in flag-clearing abilities; they can rip through a couple hundred flags without missing anything, while others need a bit more time to think about each one. If moderators are the community's exception handlers, shouldn't SE be the moderator exception handler? Meaning, if a community coordinator finds evidence that a moderator isn't pulling his fair share, he can look into the situation furthur. Base this on the moderator statistics if you want, but don't publish the criteria, and for sure don't make it something we have to worry about. Use it as a guideline to alert the community coordinators that there may be a problem, and then handle it on a case by case basis. Processing flags isn't the only useful thing a moderator can do. Judging performance only by flag processing seems unfair and not necessarily useful. Perhaps diamond-hood should have a term limit? Or, maybe, two types of moderators: full diamonds can box people and otherwise take radical steps. Mere paste moderators can just act on flags unilaterally. Maybe, oh, 30K makes a paste moderator? Yes you cannot keep adding moderators to remedy the problem because the problem will keep growing as the user-base grows, thus more and more moderators... One thing that comes to mind, how often do moderators see people abusing flags? Are there steps in place to warn or maybe even take rep away from users who are caught abusing flags? Do the users know that they will lose rep when they abuse flags? Why not allow users with a considerable amount of reputation (at the moderator's discretion) "Apply" to be a "Flag-Moderator", and maybe give these Flag-Moderators a point system of their own, separate from the regular user point system based on number of flags covered in an hour/day/week/month/all time, the number of topics of flags covered, etc. This will give the same sense of "I MUST HAVE POINTS NOM NOM NOM" as the rest of the stack exchange community, while helping to remedy the problem. I propose that on Stack Overflow, all elected community moderators must close a 'reasonable' number of flags while they are on the site. Yes moderators should be pulling some weight because they took on the role, but imposing a consequence of a type of "Quota" will only shun the idea of becoming a moderator. Instead install a reward system over going for a penalty system when it comes to volunteers. If moderators are inactive they should be let go from the position. How is moderator inactivity identified and handled? What are the privileges which only moderators have? What is the “2016 Moderator Elections” about? What should we include in training for moderators?